Antifungal cream is used to treat a variety of fungal infections of the skin, including Athlete’s Foot, Jock Itch, and Ringworm. This cream is recommended for use after laser nail treatment to eliminate any skin fungus that might lead to re-infection of the nail. The fungus that infects the toenail is usually the same fungus that causes athletes foot. 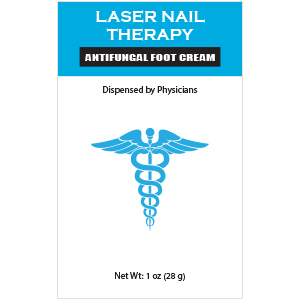 Preventing and treating skin fungus, will help prevent toenail fungus.